Does a pampered, pasture-raised, animal welfare approved, and all around well loved chicken taste better and is it healthier for you than your typical supermarket broiler? Is it worth paying multiples of the price for the former? Or is the enhanced flavor mostly a figment of your imagination? And even if it is mostly in your mind does paying the extra bucks make you a better person because your bird’s brief tenure on this planet was a pleasure from start to finish? These are some of the questions I ask myself whenever I purchase a prize pullet at places like Kinderhook Farm, a lovely, scenic establishment in Ghent, NY whose cattle, sheep and chickens lead the good life. 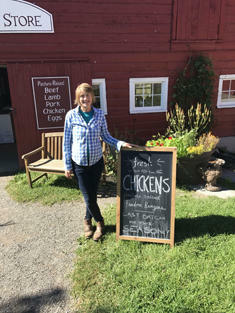 I shared these and other spiritual concerns with Georgia Rainey, one of the partners at the farm when I dropped by Sunday afternoon to pick up a fresh Freedom Ranger chicken – the last batch of the season, as a chalkboard sign in front of the farm’s store advertised. But before I get to the chickens I want to express my gratitude to Georgia’s husband Lee who gave me a tip that has made my life infinitely easier and that I’m happy to share with you, if you don’t already know it. If you have a vacuum packed frozen bird, steak, chopped meat, etc. all it takes to defrost it, typically in under an hour, is to let it sit in a pot of cold water. No thawing overnight. No zapping it in your microwave. But back to the fresh chickens. They’re eighty days old when they’re processed and part of the Label Rouge program in France. That’s a pasture-raised protocol that now constitutes a third of the French poultry market. “They’re a strong foraging bird,” Georgia told me. Anna Hodson, the farm’s shepherd, who attended a workshop on processing the hens in the most humane way possible, said their diet consists of grain feed supplemented by things like apples and insects. They also get fishmeal, the meal coming from sustainably raised fish under the auspices of the Marine Stewardship Council. That’s an organization dedicated to keeping our oceans and the organisms that come from it healthy and plentiful. In other words, these birds have more impressive credentials than the average tenured Harvard professor. But how much do they actually forage? I’m only asking because if I was a chicken and knew I was getting three squares a day, I think I’d just hang out around the coop drinking, smoking cigarettes and getting into trouble. But being honest with myself, I can’t be confident that if I blind tasted one of their chickens versus the supermarket variety I could tell the difference. How much of the subtle flavor notes is the money talking? “The main difference I’ve noticed,” Georgia told me, “is the texture of the meat. They’re firmer.” She meant her chickens. That’s true. A store bought roaster – or “commodity product,” as Georgia describes them – is soft and flabby. The Kinderhook Farm variety feels like it hangs out at the gym all day lifting weights. Also, I’ve noticed that if you boil them, the resulting broth is much richer than with a supermarket chicken. Plus, they’re free of antibiotics, which is kind of a big deal. I was almost sold, except for the fact than I’m a cheapskate. And also because of the convenience of those tasty spit-roasted supermarket chickens. When humans, or whatever we evolve into, look back at our society thousands of years from now, I’m fairly confident they’re regard the delicious rotisserie chicken as a high point in the history of Western Civilization. Kinderhook Farm’s chickens are also humanely slaughtered. This may be more information than you want or need -- and you might want to shield the ears of children -- but they’re placed upside down in a cone and stunned immediately so as to minimize their distress. The workshop that Anna attended involved helping make the bird’s transit from this life, where they had it pretty good, to the next one where they’ll hopefully have it even better, as seamless as possible. But back to the meat, and whether she can honestly tell the difference. Anna confided that she was a vegetarian most of her life. So Kinderhook Farm’s chickens are the only ones she’s known. But what if she goes out to dinner? Talk about a charmed life. On a visit to WAMC’s studio in Albany last week a friendly staffer offered me a marshmallow peep. I hesitated and finally had to reject her generosity. When my brothers and I were born my grandmother planted spruce trees for each of us on the front lawn of the house that has now passed down to me. My wife visited the British Virgin Islands in the late 1970’s, part of a crew to sail a boat back to New York City. Their departure was delayed several weeks, giving them a chance to get to know Tortola, the largest of the islands. With the headlines – a Mexican earthquake sandwiched between two superstorms – sounding apocalyptic, mental health almost requires those of us out of harm’s way not only to give thanks but also to take solace in life's smaller pleasures. There are many benefits to taking a vacation abroad – the charming, if unquantifiable stimulus on the brain when you visit new places; good food; and the opportunity to relax; whether in my case that means taking long walks through terrain more dramatic than our woods or going swimming in bodies of water significantly larger and less murky than our pond.